Buying gemstones and gemstone jewelry can be intimidating. This page contains useful information on how to assess the value of jewelry so that you can be a brilliantly empowered gemstone shopper. Be sure to check out the pages specific to any gemstone you are interested in. The quality of a gemstone depends on many different characteristics. Four of them can be easily remembered as the 4 C s: Color, Clarity, Cut and Carat. Color This refers to the color of a gemstone. In general, the more vibrant, strong and beautiful the color is, the more valuable the stone. This strength in color is often called Intensity Examples of color intensity: Another aspect of a stone s color that can effect its value is its rarity. For example, a golden-pink topaz (Imperial Topaz) is more valuable than a blue topaz, all other characteristics being equal. This is because it is harder to find topaz of this color. Too Light Amethyst: This stone is a very pale, dull unattractive color. It is therefore, relatively less valuable. Better Color Amethyst: The color here is stronger and more attractive, though not "top color." Some people like this color better. It is easy to find. Best Color Amethyst: This is the ideal and most valuable color for amethyst. It is intense, dark and beautiful. Rare Color in Amethyst. The flashes of red in this amethyst make it very rare and valuable. A large stone of this color will command top prices. Poor Clarity: This stone is almost opaque. We can not see into it, nor can we see any light reflecting or glowing from the inside because of the thick mineral deposits (inclusions) inside it. Sapphires of this clarity are common and less valuable Decent Clarity: We can see into this sapphire somewhat: depth of color and light reflecting from a few facets. The white cloudy areas still impede its beauty and make it less valuable. Typical Clarity: This sapphire is not perfectly clear, but we can catch light from most of the bottom facets. This is representative of what is widely available in the market and medium priced (depending also on color, cut and size) As Good as it Gets. Wow. A very nice sapphire, which as far as the eye can tell is very clear. We see into the whole stone and catch a lot of reflected light. Sapphire like this are rare and command top prices. Faceted This is the most common method in fine jewelry. Faceting allows for the most sparkle and light reflection. . Simply put, you can tell a good cut (faceted stone) by how well it sparkles. A properly cut stone has its facets at particular angles to reflect the most light possible. This is because cutting a stone at the best reflective angles often means reducing the size and weight of the stone. Carat When it comes to gemstones, size matters. All else being equal, the bigger the stone, the more valuable it is. In wholesale gem trading, gems are often priced per carat. It would make sense therefore that the more carats, the more its worth. However, it doesn t stop there. An additional factor in the value is the rarity of large stones. 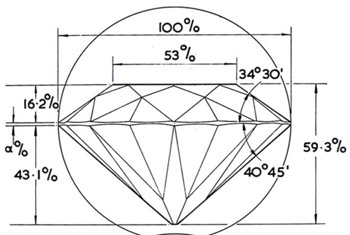 This means that the larger the stone, the higher the price per carat. For example, a 1 carat ruby with a nice color and cut might cost $700. But a 5 carat ruby of similar cut and color will not cost $3500 (5 X $700); it might cost $10,000. This is because it is very rare to find a ruby that is 5 carats. The effect that size has on price and value is determined by how rare large stones are. For example, very large pieces of amethyst and topaz are relatively easy to find meaning that the price of large stones is not exponentially higher. Well which of these C s is most important Should you choose the most intensely colored stone or the biggest stone It depends on the kind of stone. Each of the C s have varying degrees of importance depending on the stone, but all of them play a role to some degree. Rarity/ Uniqueness Another factor in a gemstone s value is its uniqueness. This means unusual colors or patterns in the stone or rare and interesting inclusions or impurities. These things are often appreciated and valued by custom, fine jewelers, but overlooked by wholesalers. It may be hard to get a really good deal just going by the 4 C s because everyone who buys and sells gemstones and gemstone jewelry professionally goes by them to assess value. But if you are a careful observer, you may be able to spot something special in a stone that someone else has missed. Interesting inclusions: This is a simple peice of quartz: not at all rare. However, any observer of this stone would notice the garden like inclusions of other minerals and pay a high price for something so unique and interesting. Color Bands: The way color plays in a stone can make a material special, unique and therefore valuable to the right person, as is the case with this watermelon tourmaline. Rutile inclusions: Another simple peice of quartz, but the star shaped inclusions of rutile make it interesting and more valuable to a fine jeweler or collector. Imitation: This is what can most fairly be called fake . When something is made to look like a gemstone that is actually a totally different substance-that is imitation. For example, imagine you are at a flea market and you see a ring with a pretty red stone and the seller tells you it is a ruby. However, when you take it to get appraised you find out it is glass. You were sold an imitation or a fake. A note about fakes: this scenario sounds disastrous and might make you very afraid to ever buy gemstone jewelry, but the truth is, it happens rarely. Selling fake jewelry (and claiming it is real) is fraud. Because gemstones are such a sensitive product (expensive and mysterious), reputation is everything.Selling one fake stone even after 25 years of selling good jewelry can ruin a seller's livelihood by destroying their reputation forever. Therefore, rest assured that most people who are professional jewelers or gemstone sellers will do everything possible to make sure they don t sell you something fake. For more information on how to identify imitations of gemstones,read more on the individual gemstones pages. Synthetic/ Created :Synthetic gemstones are real gemstones in that their mineral composition is exactly the same as those in nature. The only difference is that they are made by humans in a short amount of time versus by nature over hundreds of thousands of years. Created stones are always less valuable than natural stones because they are less rare. Generally, created stones are only available for more expensive gemstones such as diamonds, rubies, sapphires and emeralds. One example of a widely accepted created gemstone is the cultured pearl: very prevalent even in the most elite jewelry. A reputable seller (anyone with anything to lose) will always state whether the stone is synthetic. But if you aren t sure, one way to form an educated guess is to observe the clarity. Man made stones are usually much cleaner and clearer than natural stones. So if you see a bright clear sparkling ruby, sapphire or emerald that isn t extremely expensive, you can bet that it is synthetic. Pick of synthetic emerald and real emerald. Treated/enhanced:Many gemstones will undergo some kind of treatment between the time they are mined and the time they reach you. These treatments are carried out in order to improve the appearance of the stone (color or clarity). Treatments include_once exposure to very high temperatures, irradiation, heat or irradiation combined with another chemical (e.g. titanium), oiling, and waxing. Treated gemstones are not considered less valuable as long as the treatment is considered permanent by relevant gemological organizations. That means that the treatment will not wear off with time. In some kinds of gemstones, treatments are so common that it is nearly impossible to find an untreated one. Rubies are an example of this. Other gemstones could not exist without treatments, e.g. Mystic topaz. Read more about treatments on the pages of individual gemstones. Natural:The word natural is usually used to mean that the gemstone came is not man made. It does not necessarily mean untreated. This word, however, does not have a standardized meaning and is often abused. So if you see the word natural in the description of a gemstone you are interested in buying, keep reading or asking questions. Genuine: This word usually means that it is not fake . It has no implications of being from the earth natural or untreated . For example, it is common to see descriptions of jewelry that contain the words Genuine created ruby. It just means that it is mineralogically a ruby. Untreated: When you see this word in a jewelry description, you can know that you re seeing something rare (depending on the stone). If you see an untreated ruby for sale, it will be extremely valuable and expensive. Untreated aquamarine or topaz of intense color is also rare and very special. However, if you see Untreated amethyst, it s not such a big deal because amethyst is very available untreated. Learn more about treatments of individual gemstones on the relevant pages of this site. Plz tell me best quality pink Color 35 cent dimond cost without gold. What are factors safhires of same weight scosts different? Is the desnsity, clarity, homogeneous , transparency ,colour or some thing else?. can two saphires of same size , weight & colour be compared? How to estimate the cost/ratti?